Burt’s Bees Beeswax Lip Balm* – Believe it or not I’d never actually tried anything by Burt’s Bees until I was kindly sent a gift set recently, and I have to say I’m now hooked! I’ve been putting a slick of this on my lips after washing my face before bed, and in the morning my lips feels so soft and nourished. I also put some on before applying bold lipstick to ensure there’s no dry patches for the colour to cling to. 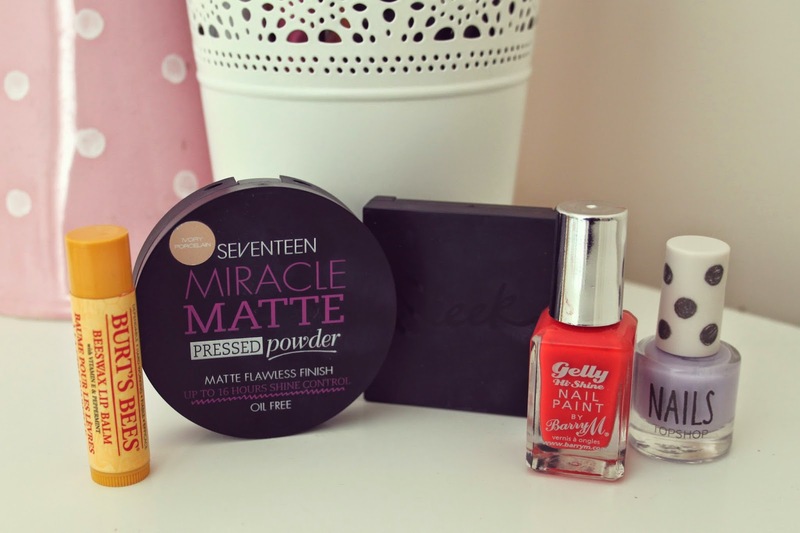 Definitely a make up staple for me from now on! Seventeen Miracle Matte Pressed Powder – I’m an avid Mac MSF fan, but since the purse strings have been tightened lately I’ve had to find a temporary alternative. I popped this one in my basket at Boots for a cheery £3.99 and to be honest I wasn’t expecting all that much. I got it home to find it had been smashed to smithereens (if I wanted loose powder Boots, I wouldn’t have chosen pressed! ), but for the price I really couldn’t see the point in driving the forty minute round journey for an exchange. I’ve since been using the powder and spilt it all over the carpet on a couple of occassions, but let’s look past that for a moment. This powder it pretty darn good! It’s the perfect amount of ‘matte’. It keeps my skin from looking shiny throughout the day and is super light weight which means no caking! I’m hoping to have more luck with the next one I purchase, but thumbs up from me for the powder itself. Sleek Brow Kit – This is something I rediscovered when rummaging through my make up drawer a couple of weeks ago. When I first got this I obviously wasn’t all that impressed as I’d only used it once or twice. I’ve been giving it another go though and have been loving the gel applied with an angled brush to fill in sparse areas of the old brows. Barry M Gelly Hi Shine Nail Paint in ‘Passion Fruit’ – I dug out this colour from when they Gelly polishes were originally launched and couldn’t believe it hadn’t dried up in the slightest. I loved it then and I still love it now. Such a lovely, long lasting high shine polish in a bright summery coral shade. Topshop Nail Polish in ‘Parma Violet’ – Another polish I’ve rekindled my love for. This is a beautiful very pale lilac that is perfect for this Spring’s barely there white/pastel trend. L’Oreal Elvive Extraordinary Oil* – This is something I’ve raved about in the past and I’ve been using it a whole lot more lately. You may have noticed that since having a fringe cut in, I haven’t been curling my hair quite as much. I went for the style I have in particular as it’s not as high maintenance and doesn’t require as much heat, purely because my hair was becoming very damaged and splitting easily. I’m using the oil before blow drying to help protect it, at the tips especially, and also use a little bit on the ends after styling to give a glossy, healthier look. I’d recommend giving this a go if you want a cheaper alternative to Moroccan Oil! Daisy Eau So Fresh by Marc Jacobs* – Hands down one of my top scents of all time! I bought my first bottle of this at the airport before flying to Rhodes a couple of years ago, so this scent completely takes me back to there. I was very kindly sent a bottle of this as part of my work with Alpro for the #AlproTops challenge, and fell head over heels for it a second time over. It’s strange how a scent can bring back so many memories, but as soon as I sprayed it I immediately thought about our holiday. Lovely! Sanctuary Spa 2 Day Moisture Shower Oil* – This is a bit of a cheat as I’ve only really used this for the back end of the month, but so far, so good. You basically use this as a shower gel, except it’s in an oil form that leaves your skin feeling amazingly soft and locks in moisture for 2 days. I really like the Sanctuary range and this is no exception. It’s got a really nice, delicate scent to it too which is a plus. 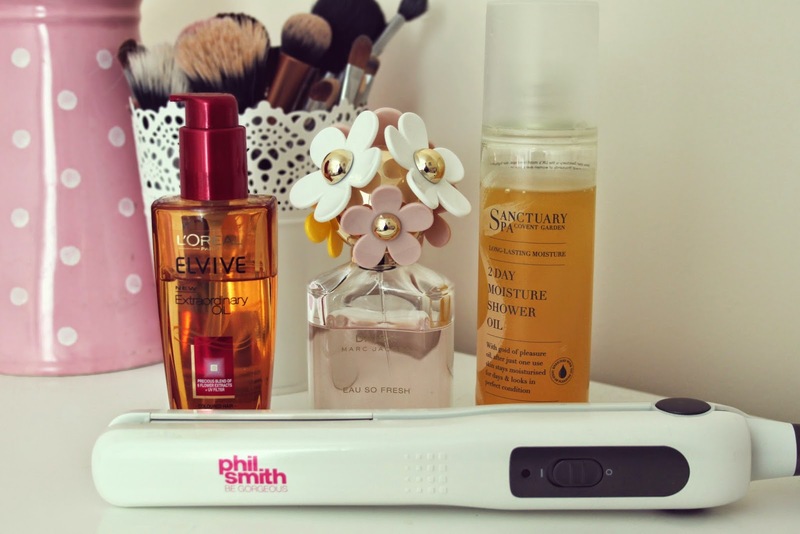 Phil Smith Hair Straighteners – My hair is naturally wavy, so the addition of a fringe mixed with the fact I have a very prominent cow lick (lol) can be a pain to style. I passed on my beloved GHDs to my mum when I decided to ditch the straight hair, and I’m awful at blow drying hair straight, so I spotted these for £9.99 in Sainsburys and decided to give them a try. Besides, they are only to tame my fringe, so I didn’t want to waste a lot of money. For less than £10, these are actually pretty decent! They get super hot – hot enough to rival all the top branded straighteners – and leave my fringe looking groomed and glossy! So those are my favourites for the month of April! What products have you been loving over the past month? 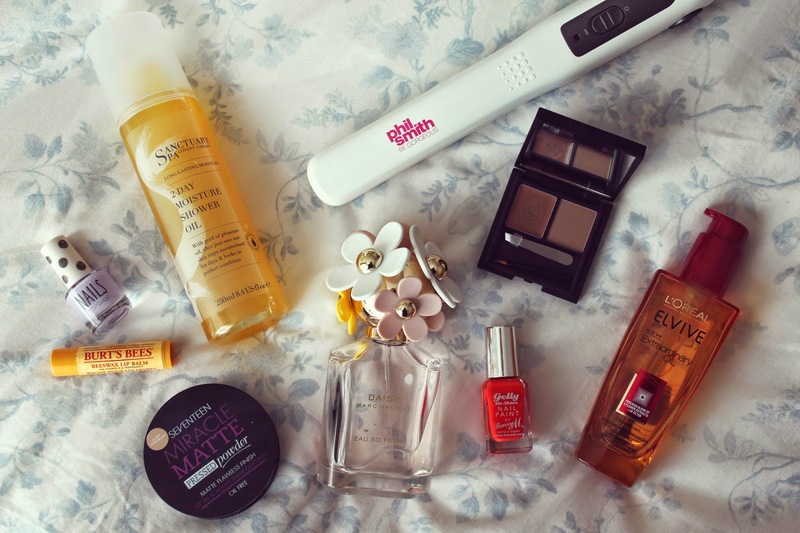 I’ve already got a load of lovely things to show you in my next favourites that I’m quickly becoming obsessed with. Can’t wait to share those with you in a few weeks. "CRAFTY VINTAGE WEEKENDER AT BROCKHOLES, PRESTON"